Indigenous children were beaten, sexually assaulted, stripped and chained to beds, and forced to eat their own vomit, it has been alleged at the royal commission into institutional responses to child sexual abuse on Monday. The 17th public hearing of the royal commission began hearing from members of the stolen generations who say they were sexually abused at a Darwin home. It’s examining how the government and administrators responded to the allegations of child sexual abuse by employees at the Retta Dixon home between 1946 and 1980, when it closed. Retta Dixon was one of the main government-run homes for children of mixed Aboriginal and non-Aboriginal descent forcibly removed from their families. Established by Christian missionaries in the 1930s, it also housed unmarried mothers and their babies, and temporary visitors. At its peak it held 120 people, according to the federal government’s 1997 Bringing Them Home report. “It is important to acknowledge and understand that most of the children … were also members of the stolen generation, to understand the full impact of the alleged abuse on them,” said counsel assisting the commission, Sophie David, SC. However, David said the inquiry would not focus on government policy and legislative framework beyond the establishment of the Retta Dixon home. Under the spotlight are the responses of the Australian Indigenous Ministries, formerly the Aborigines Inland Mission (Aim) and the Northern Territory and commonwealth governments to allegations raised at the Retta Dixon home, as well as responses from the NT police force and director of public prosecutions (DPP) to specific allegations against Donald Henderson, a house parent in the 1960s and 1970s. Henderson was prosecuted in 1975 for sexual offences against numerous children and again in 2002, Davis told the hearing. In both instances, conviction was not pursued. In 2002 the DPP did not proceed with prosecution on the basis that there was no reasonable prospect of conviction. Henderson, who is alive and has been notified of the inquiry, maintains his denial of the allegations. A witness, referred to as AKU, told the commission she was physically and sexually abused by Henderson from the age of five until she was 13, including being forced to eat her own vomit. “Don Henderson would come in to my bedroom on nights when [his wife] was out and say, ‘[AKU], come here’ and I would have to get up and follow him into his bedroom,” she told the commission. AKU said children were beaten as punishment for even minor transgressions every day, including being caned until their hands bled, or punched. “I can’t just turn it off,” she said, telling the commission she still has nightmares about the Retta Dixon home. 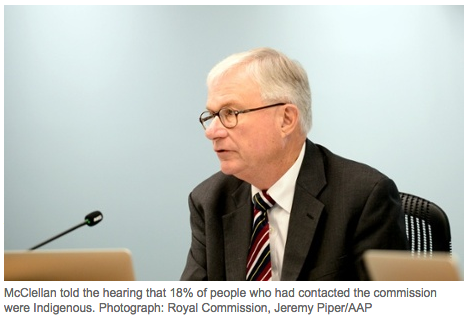 “The abuse I suffered at Retta Dixon took my childhood away,” AKU told the commission. Sandra Joy Kitching told the commission that because she and other children were “half caste”, she believed staff “thought they could beat the colour out of us to make us white”. “At least that’s how I thought of it. That’s why they took us from Alice to Darwin,” she said. Kitching alleged that a house parent, George Pounder, would watch the young girls shower and chain them to their beds as punishment for transgressions. Attempts to report abuse to the superintendent, Mervyn Pattermore, were ignored, including Pounder driving her to school alone every day. “He would touch me every time I got in the car to go to school,” she said. Kitching alleged Pounder force fed a child, and when she tried to intervene he stripped her and chained her up, saying “that’s what Aboriginal people deserve”. Kitching said never reported the abuse to anyone other than Pattermore. “There was no one else to report to,” she said. The public hearing began with testimony from a former resident, Lorna Cubillo. In 1947, a nine-year-old Cubillo was taken from a central Australian Aboriginal settlement and put in the Retta Dixon home. In her testimony Cubillo described being taken from her grandmother, and the abuse she allegedly suffered at the home at the hands of a missionary employee, Mr Walter. Walter is alive and has been notified of the hearing. Cubillo described Walter’s wife as a “lovely person” who taught her about puberty, and said she felt like they were sisters. However, she said Walter was abusive, and would beat her with a buckle. When she reached puberty Walter began sexually assaulting her as well, Cubillo said. “He flogged me that much that after a while it didn’t hurt any more. I didn’t cry though, because he was not winning,” Cubillo told the commission. Hitting Walter in the diaphragm, he dropped to the floor, Cubillo said. Terrified of repercussions, she fled, but was not punished on her return. There was no action taken by staff despite them treating her visible injuries from the beating. Cubillo told the commission she believed she lost a court case against Walter in 1998 because she was “too ashamed” to tell anyone about the abuse she suffered at Retta Dixon. Despite eventually reconnecting with her family, Cubillo said her enforced removal to Retta Dixon meant she had lost connection to her people and her country. “I’m very sad about the loss of my culture. I’ve never been initiated in a tribal way. She said she felt unable to express a loving and affectionate relationship with her children as a result of her time at the Retta Dixon home. “I loved my children, but it’s the way you kiss and hug them like their father did,” she clarified. Cubillo’s son was in attendance at the public hearing. At the end of her statement, Cubillo was asked what she would like to see happen as a result of the inquiry. She said she would like an apology from the government and Aim. “I’d like a fair system. We were denied many things,” said Cubillo. The inquiry is being held in Darwin’s supreme court building, the same place where almost 15 years ago Cubillo and an Indigenous man, Peter Gunner, lost a joint federal court battle for compensation against the federal government as members of the stolen generations. In total, the hearing will hear from nine former residents and a former house mother. It will also hear testimony from current and former government and law enforcement authorities, including the general director of Aim, the Rev Trevor Leggott; the CEO of the Department of Attorney General and Justice for the NT, Gregory Shanahan, and the territory’s children’s commissioner, Howard Bath. Community announcements in Yolngu Matha and Modern Tiwi began airing on Northern Territory radio stations in Darwin and more than 40 remote locations last week. It is the first time the commission has held a hearing in the Northern Territory. It is also the first public hearing to predominantly involve Indigenous people. A number of Aboriginal women gave evidence at the inquiry into the Parramatta Girls Home and Hay Institute. Of all the people who have contacted the commission, 827 (18%) are Indigenous, the chief commissioner, Peter McClellan, said as he opened the public hearing on Monday morning. He added that 9% of people coming to private sessions are from Aboriginal communities. The inquiry into the Retta Dixon home is expected to run for about two weeks.